The British Virgin Islands, about 50 (mostly uninhabited) islands and cays, are one of the Caribbean’s most popular destinations. Fought over for centuries, they were finally controlled by the British in the mid-1600s, and later became an official British colony. Tourism is a major business in the islands, as it generates an estimated 45% of the national income. The BVI economic structure is similar to that of the U.S. Virgin Islands, and both use the U.S. Dollar as their local currency. Steeped in the history of the British Navy, the islands are ringed by shipwrecks; the most famous of these – The RMS Rhone – is now a national marine park, and a favorite scuba diving point. Road Town, the capital city, is crammed with markets, boutiques and restaurants, and remains a favorite stop for experienced cruise ship passengers. On Tortola the first rays light up the green slopes that fall from Mount Sage to secluded palm-fringed beaches far below. The first ferry of the day is going out as the first sail boat appears on the horizon. The shops are laying out their West Indian wares: spices, jams, rums, soaps, and hand-crafted jewellery. Around the island, guests are being stirred awake by the first light. They’ve spent the night in private hillside villas, eleganthotels or beach resorts. Their day ahead may take them snorkelling off a deserted beach, scuba diving, horseback riding, or sailing the deep blue sea. But for now, there’s time to rest a little longer. Tortola, the largest of the British Virgin Islands, is the hub of the chain. It offers visitors peace and quiet, plus every activity they could hope for. The range of accommodations runs from posh hotels to beach side cottages. And Tortola offers as many choices in cuisine from continental to local fare. Breakfast can be a cappuccino and croissant, lunch a West Indian roti, and dinner a four-star meal in a converted sugar mill, where the only sound will be the pounding of the surf. By mid-morning in Virgin Gorda, the sun worshippers have settled down on one of the many deserted beaches that fringe the island: Savannah Bay, Handsome Bay, or Big Trunk Bay. The pace of life is slow on Virgin Gorda, but if you don’t want to spend the day on a beach, there are plenty of other activities. You could explore The Baths, where huge boulders seem to have been arranged by a playful giant to provide a myriad of rock pools, secret beaches, and trails. Visit the Copper Mine standing guard against the blue Atlantic. Or just spend the morning at a hillside restaurant cooled by gentle breezes while you watch the ferries cross the North Sound far below. Measuring just eight-and-a-half-miles long, Virgin Gorda is the third largest in the island chain. Dramatic slopes plunge from Gorda Peak to the turquoise waters far below. There’s no better way to end a day than with a rum concoction on the terrace of one of the small hotelsand guest cottages along Anegada’s south shore. Especially after a dinner of Anegada’s famous lobster—reputed to be the best in the Caribbean. You can watch the sun disappear into the surf that breaks on the reef surrounding Anegada. For centuries ships have been lost on this treacherous reef, but these wrecks provide a boon for today’s visitors. They are home to countless exotic fish and marine life, making Anegada a paradise for scuba divers and snorkellers. Anegada is an island of coral sand, and its beaches are the loveliest in the Caribbean. And they’re so deserted, chances are you won’t see another set of footsteps on the sand. But you can always find a shady spot at a beach side bar to sit and sip a cool drink. The British Virgin Islands are best known for perfect sailing conditions, but they also have more than 100 dive sites well worth an underwater visit. While the BVI may not have walls or drift diving, The British Virgin Islands have a wide variety of exotic dive sites with countless reefs, towering coral pinnacles, underwater caves, lava tunnels, canyons, massive boulders and grottoes. The BVI have a choice of dive sites that range from the novice snorkeler the experienced scuba diver. Not only does the dive sites boast dramatic sea caverns and extraordinary shipwrecks and ir temperatures between 80 and 90 degrees Fahrenheit year-round but visibility may reach more than 100 feet. Exploring the BVI underwater havens is in itself extraordinary. Land-based divers can lodge at world-class resorts, quiet villas or campgrounds. . For those who wish to make diving and boating the focus of their holiday, the options range from adventurous to luxurious. 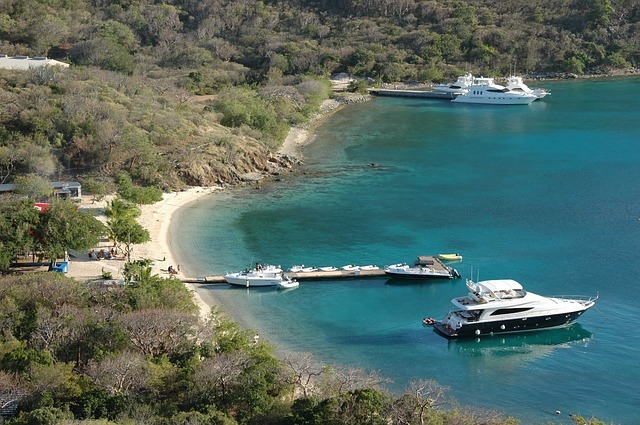 Guided tours of Smuggler’s Cove on Tortola, Great Dog Island, Blonde Rock, or dozens of other sites are one possibility. The climate is subtropical and tempered by trade winds. There is little variation between summer and winter. Rainfall is low, varying slightly from island to island. Night-time temperatures drop to a comfortable level. Visitors should note that the British Virgin Islands are susceptible to hurricanes and earthquakes, although these are by no means a frequent occurrence. The primary hurricane season is from June to November.